Spare a thought this Christmas Eve for Santa Claus, who will be overseeing the conclusion of a fiendishly difficult data management and home delivery project… for another year at least. As you are tucked up in your beds with your stockings hung up, Santa will be wrapping up a mind-bogglingly complex process that makes online shopping on Black Friday look like a walk in the park. So, it’s December 24, the sleigh is stacked full of presents at the North Pole and the reindeer are ready to put their best hooves – or noses – forward on the busiest night shift imaginable. But what will it entail from a data-management perspective? 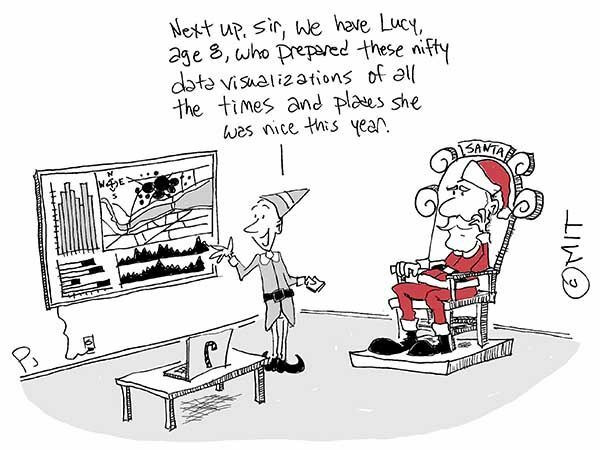 Are Santa, Mrs Claus and the elves ready for this most extreme of data challenges? Firstly, the gift requests have to be processed. There are about 1.86 billion children aged 14 years and younger in the world, according to the CIA World Factbook. Of course, not every child will write to Santa due to cultural and religious differences, but that still leaves around 700 million children. Then there are the ones who have been naughty rather than nice… but let’s leave a few variables to one side for now. Assuming that the elves at the North Pole are no longer operating with an antiquated pen-and-paper system and have upgraded to more modern data-processing techniques, we can reasonably assume that it might take about 20 minutes to process each child’s request – considering there are likely to be multiple gift requests per individual. If drawings of the presents are also processed by the North Pole’s back office so there are images as well as words, it can be expected that the initial process of receiving and processing all of the requests would generate about three petabytes of data, given that Facebook generated four petabytes of data per day through its 1.08 billion daily users last year, all of whom spent an average of 20 minutes on the site. But that’s only part of the story. Then there are the gifts themselves. Finally, though, the greatest task of all – navigating from house to house around the world. The surface area of the planet is 510 million square kilometres and, on average, the homes of the children would be about 1.47 kilometres apart. Santa will, therefore, have to travel a total of 352,510,000 kilometres. If it is assumed that Santa and his reindeer keep the sleigh to the equivalent of the UK’s national road-based speed limit (112.6 kilometres per hour), then it would take 3.131 million hours to travel non-stop around the globe to every home. You would imagine therefore that Santa will delegate delivery in certain areas and will waste little time in knocking back a well-earned tot of whisky at every home. With time of the essence, a navigational tool will be vital, but data usage of the Google Maps app on the move can reach about 36 megabytes per hour. Therefore, Santa and his team would generate 112,703,020 megabytes – or nearly 113 petabytes – in data, through using the app to visit every home – the equivalent capacity of nearly 170 million CD-ROMS. All in all, few can argue that Santa will handle a huge volume of data to get the job done on Christmas Eve. Some would say it’s an impossible task but, without giving away too many trade secrets, let’s just say that Santa will be toasting GeoSpock and our data-management capabilities when he finally puts up his weary feet to enjoy his 700,000,001st whisky of the night. GeoSpock’s efficient data indexing and management capabilities will be essential if Santa is to keep up with all his deliveries in the future. For more information about how GeoSpock can save Christmas, click here.